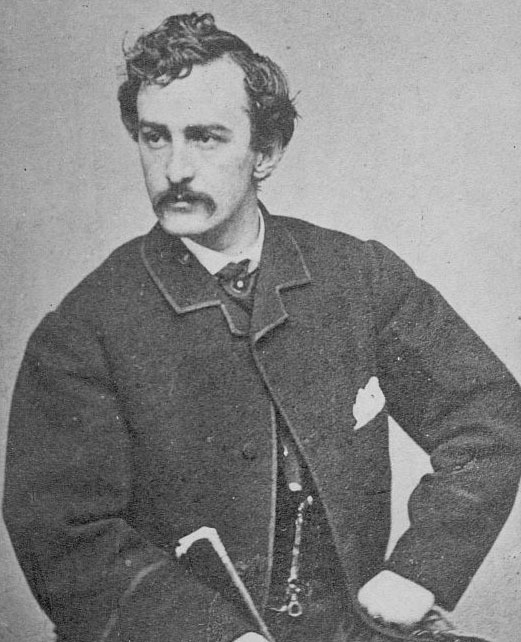 Abraham Lincoln's Assassin, John Wilkes Booth, Really Was In Brooklyn - Why? The civil war "docudrama" the Cosgrove Report, asserts that the missing diary pages of John Wilkes Booth, were hidden in the Atlantic Avenue Tunnel during April, 1865- as the assassin escaped to Europe and then India. Sound far fetched? Maybe not. Lets look at the actual history, as reported in Brooklyn Daily Eagle articles from that era. First, its a known fact, that J. Wilkes Booth was a Confederate spy, in addition to being a "matinée idol" actor. Lets make a simple, and logical assumption: that Booth used his "theatrical touring circuit", as a method of meeting with other Confederate agents, operatives and Southern sympathizers in the North, known as "Copperheads". 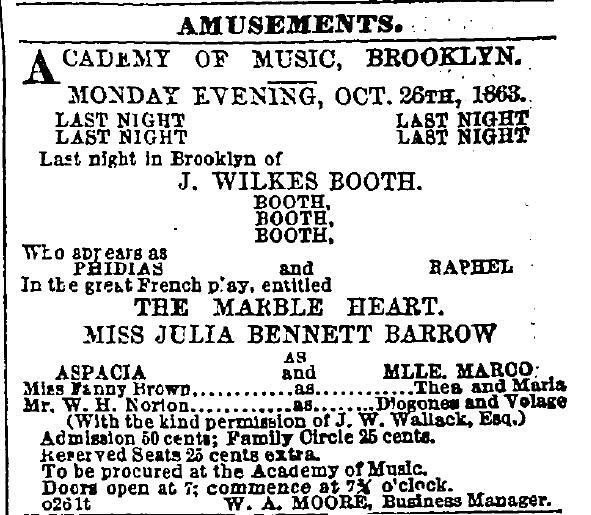 Its known that Booth played the Brooklyn Academy of Music on October 24- 26, 1863 *,**. BAM was originally located on Montague Street, between Court & Clinton Streets. Oddly enough, Booth's performance was very poorly attended ***. Rather than where and what he was playing, I'd instead like to focus on where he was staying - Manhattan hotel rooms that were well known for housing Confederate agents. In fact, Fernando Wood, then Mayor of New York City (then Manhattan) attempted to secede Manhattan from New York State and the Union, and join the South. Manhattan's economy and banking industry were highly dependent on southern cotton exports. Confederate agents later tried to "burn down New York City" by starting simultaneous fires in several Manhattan hotel rooms. The dates of Booth's appearances at BAM are highly interesting, when placed in historical perspective: On Sept 19, 1863, the battle of Chickamauga, TN, was the last great victory of Confederate forces. However, the tide was again turned against the Confederacy only two months later, at the battle of Chattanooga, TN. on Nov 23- 25, 1863 ****. According to the National Park Service website, Chickamauga/Chattanooga were "the gateway to the deep South”- particularly Georgia and the Carolinas. Booth's Brooklyn appearance was right in between those two pivotal battles. What was this Confederate spy really doing here? Booth's trip to Brooklyn a coincidence? I don't think so. I submit Booth's true purpose in visiting Brooklyn, was to meet with other Southern operatives, who may have had information on the Northern Army's pending troop movements in Tennessee. This is also when Booth could have learned about "the sealed up" Atlantic Avenue tunnel. According to another circa 1865 Brooklyn Eagle article *****, the City of Brooklyn paid a contractor $25 "to repair the manhole into the Atlantic Avenue tunnel between Henry Street and Hicks Street". Seems the tunnel wasn't completely sealed up at that time (1865). However, current visual observation shows there was never any "manhole" into the tunnel at that location. I submit this manhole was in fact located on Atlantic Avenue between Hicks Street and Columbia Street- in the section of tunnel now "behind the wall" under Hicks Street. As for Booth's complete escape after murdering Abraham Lincoln, this isn't at all a new theory. In fact, it goes all the way back to the post Civil War era. 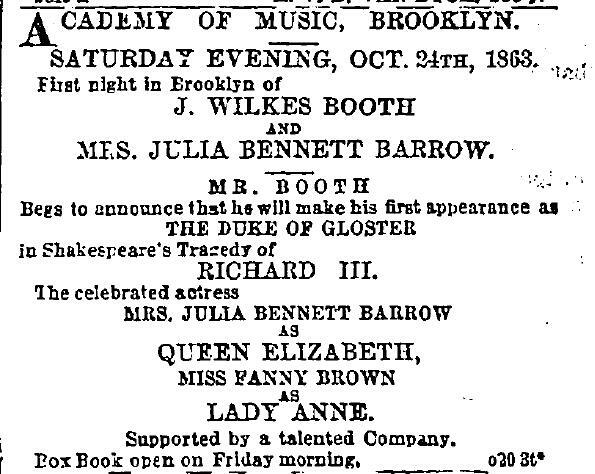 On September 6, 1867, an article appeared in the Brooklyn Eagle entitled "Is Wilkes Booth Alive?" ******. According to this writing, in the hours after the assassination, Booth disguised himself as a beggar (recall Booth was an actor), boarded a train to Baltimore, and eluded capture. This writing further purports that "But certain is that he [Secretary of War, Edwin Stanton] took effective measures to prevent the identification of Booth's alleged body. Not only were all of Booth's old associates excluded, and the public prevented from seeing the corpse, but the latter [the corpse] was destroyed by a chemical process, so that no vestige of it now remains". One of Booth's many former lovers, a Ms. Louise Worcester of Alabama, purportedly revealed in the year 1890, after 23 years, that she had received a letter from Booth circa 1867, stating that he was alive and well, and that the person "captured" in a Virginia tobacco barn, was really another Confederate conspirator, who somewhat resembled Booth *******. Finally, lets look at the author of the Cosgrove Report, G.J.A. O'Tool. According to his publisher's website (W.W. Norton), O'Tool was " in charge of special problem solutions at the CIA". Further, on the CIA's own website, O'Tool is cited as "one of the CIA's in-house US Civil War espionage experts". Maybe the Cosgrove Report wasn't entirely a work of "docudrama" after all. Judge for yourself.